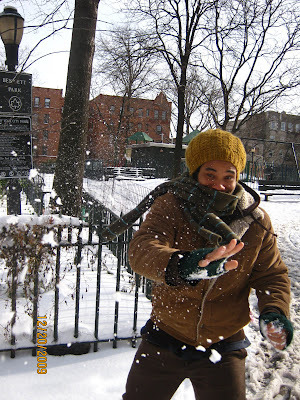 My 29th birthday began with a snowball to the face. In a good way. I worked on perfecting my snow angels. I've always been bothered by their disco pants. Shouldn't they be in gowns? Maybe I should start from the middle and move outward, then lift and repeat. It would compromise the traditional form, but the result might prove more aesthetically pleasing. 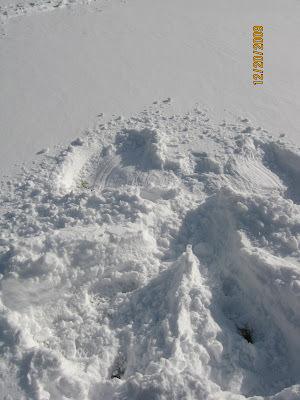 Might I revolutionize the snow angel?? I like your blog. 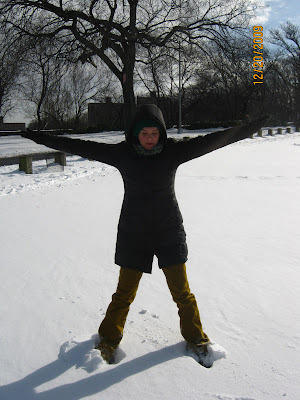 Fun subject and your snowangel looks great! Disco pants offer nothing but improvement to any angel wearing them. If you're into more classic angel attire you can remove the disco pant effect by lifting your legs into a 'froggy' pose, pushing your feet together and kicking out the center seam. 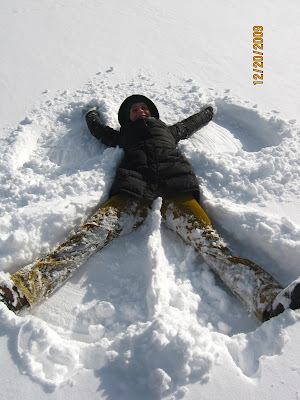 You may need to prepare for this move with a few months of yoga prior to the winter season but for traditionalist like me this is a small price to pay for the perfect snow angel.